If you’re a catwalk photographer at London Fashion Week, as I often am, you’ll exist in another world for several days each year – one of colour, bright lights, music, noise, bustle, and beautiful people wearing the latest designer trends. It’s always a slightly strange feeling when you take your place in the photographer’s pit at the end of the runway. The venue I’ve often found myself at over the years is the beautiful and refined setting of Somerset House on the Strand. This is where the world’s fashion royalty gather for an extraordinary week of haute couture and the latest ready to wear designer fashions. Shooting the catwalk shows is a discipline, you’re there to provide whoever you’re representing with the images they need. The photographs are about the clothes of course, so you’ll be looking at gaining full length, three quarter and half shots, and details. The photographs must be absolutely consistent in exposure, depth of field, and colour temperature. The rehearsals are generally the time when you’ll have a chance to get your settings sorted out ready for the show itself. You won’t be doing much, if anything, in the way of postproduction, so you need to nail the shots at the time of capture, making only minor adjustments later on to exposure if necessary and of course cropping. Shooting something like this is very different to my usual work as a portrait photographer, where I generally pause between shots. By contrast, on the catwalk, the camera remains to your eye and you’re shooting constantly in order to get the required photographs of each outfit. This does mean that eyestrain and hand and wrist cramp can really kick in. Each show can be around half an hour, at which point we get a break of about half an hour to stretch our legs/download the pictures before going back in for the next session. Once on site at London Fashion Week, there are a number of security checks to go through, then the photographers are allowed in immediately so that we can sort ourselves out before the audience are let in. Getting the right spot on the riser is crucial, this may or may not be straightforward depending on how many photographers turn up to shoot that particular show. It’s common for some of the shows to see over 100 photographers on the riser (yes, I know, pit/riser is contradictory but are well used terms for the same thing) which made the pit a dangerous place. You’re going to be shooting in portrait orientation most of the time, this will be easier if you have a battery grip fitted, but either way it can get quite painful quite quickly. Your uppermost hand will start to cramp in the lower forearm and it’s not uncommon to see photographers having to drop their cameras after a couple of minutes whilst trying to massage some life back into their wrist. To help reduce this try to use a bit of extra upward force from your lower hand, this takes some of the downward strain off the topmost arm. As far as your entire body is concerned, once you are in your spot you have to stay in it, don’t even think of moving. If you’re on the very front of the riser, on the same level as the catwalk, you must be sitting, likewise whoever is behind you must sit on the first step of the riser – everyone else will be standing (the guys at the very back may well be on ladders). I’m occasionally asked how one gets to shoot the top fashion shows, which are held in places such as London, New York, Paris, and Milan. Photographers are there strictly by invitation only, so you’ll need to be affiliated with a newspaper or magazine, one of the designers, or one of the sponsors. The sponsors ask Canon to provide photographers, with whom I’m a registered professional. Shooting the shows is undeniably glamorous at times, but also tiring and potentially stressful since you’ll be on your feet for long periods of time, holding very heavy equipment up to your face with only 15 minutes or so between each show. That doesn’t leave much opportunity to get a snack or drink so it’s vital you carry a bottle of water and some energy bars in your camera bag. You will also need sufficient capacity in terms of memory cards, I find that on average I end up with around 250 shots per show which is actually fairly conservative (some photographers shoot many more than that) and you don’t want to be filling up the card halfway through. I keep several 32 Gig cards on me, just in case. 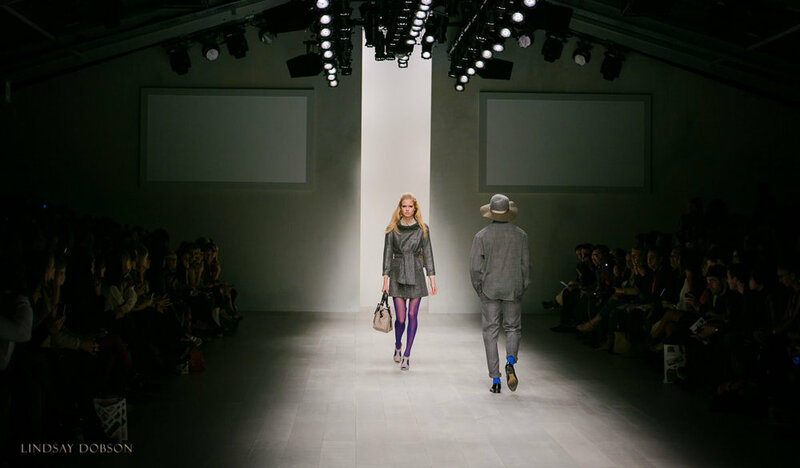 White balance – the runways at the top fashion shows are generally extremely well lit because the clothes have to be shown off accurately to the fashion editors and of course the photographers who have to record whatever is being shown. In my experience the lighting will be tungsten so you can simply shoot on that white balance preset or dial in anything from 3000 to 3200 Kelvin. If you’re shooting RAW then it’s not the end of the world if your WB is off, you can batch adjust, though it’s always best to get things right at the time. However if you’re uploading immediately and sending the shots straight to your editor then shooting JPEG is common practice – this is where accurate WB is essential. Exposure – it’s vital that all of your exposures are as consistent as they can be, you won’t have time to be tweaking all of your shots afterwards. Some catwalk photographers will shoot in Aperture priority and others will shoot fully manual. It’s okay to shoot in Av mode but your exposures will vary according to the balance of light and dark tones within any given scene. More importantly, your shutter speed will also vary, and if it drops significantly you’ll start to lose some shots to motion blur. It’s generally better to determine a manual setting from the area of the runway which is best lit and which will yield most of your shots. When using manual settings the exposure will of course be less at the back of the runway so you’ll need to adjust on the fly. Using Av mode riding the exposure compensation dial is another option. Using Tv is not uncommon if you’re concerned about motion blur – your aperture will vary a little but not enough to be noticeable (that said, ending up with a wide open aperture as the models get closer is risky so setting auto ISO to a reasonable level may be necessary but don’t set it so high that noise will show in the images). In other words, there are many options and you should do what works best for you. You may not have the opportunity to test your exposures since many of the rehearsals are closed, in other words you may not be permitted to take pictures until the main show starts. Check your settings as the show progresses. At London Fashion Week I’m normally at f5.6 1/500 ISO800. Focus – how you do this will largely depend upon which camera you’re using. If your camera doesn’t have particularly good continuous autofocus it’s probably best to use one shot focus (ensuring you have sufficient depth of field and a sufficiently high shutter speed to get a sharp image) and single focus point selection. 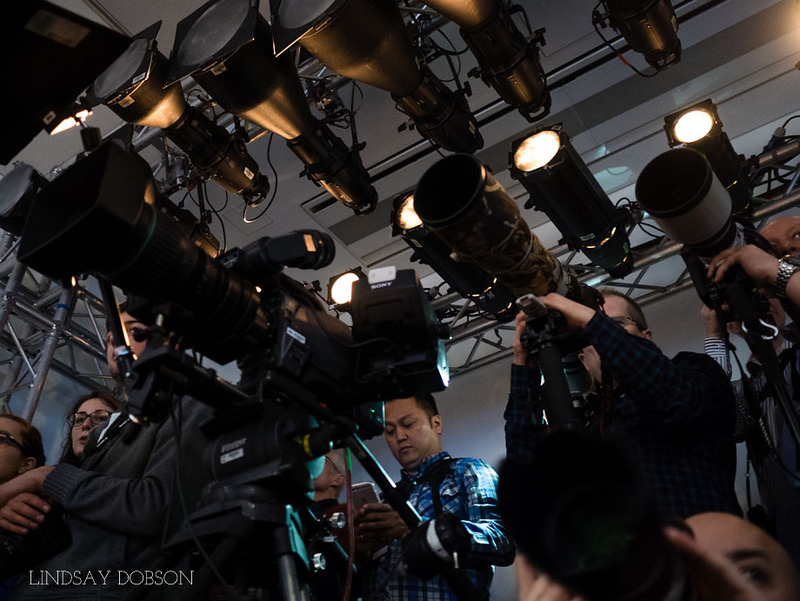 On something like the 5D MkIII (which I often shot the fashion shows with) or the 1DX continuous focus will be ideal. It’s not completely foolproof but the vast majority of your pictures will be nice and sharp. It’s also worth expanding the centre focus point slightly so that the camera has something to latch onto when you’re focusing on a face, obviously your focus points must cover your subject to avoid focus ending up on the background. Lens choice – this is fairly personal, I’ve seen everything from a 24-70 to a 400mm prime (or for lightness, a 70-200 with extender, good if you’re stuck on the back of the riser). I prefer a 70-300L. Burst mode – this is up to you, you might want to shoot individual frames or set your camera to continuous shooting (this is only worthwhile if your camera has a fairly fast burst rate). Timing – try to get the models with both feet on the ground, this will require a bit of pre-judgement so you’ll need to time your shots slightly ahead of the moment at which the feet hit the runway. Models – some are more confident and more experienced than others. Generally the more confident models will pause a little longer at the end of the runway before they turn and will make eye contact with the photographers, giving you the opportunity to get some really nice shots. Other models will turn immediately and those opportunities will be gone. Learn to decide which models are likely to do what and time your shots accordingly. Etiquette – the photographers’ pit at the premiere fashion shows will normally see upwards of 50 photographers and it’s not uncommon for twice that to squeeze in for the more high-profile collections. It can be a dangerous place and it can eat photographers alive. Once you have your spot you will need to stay there and while the show is in progress don’t even think about moving, sitting down, or getting up. There is often a pecking order depending on how long you’ve been around. But there’s plenty of banter and camaraderie too.